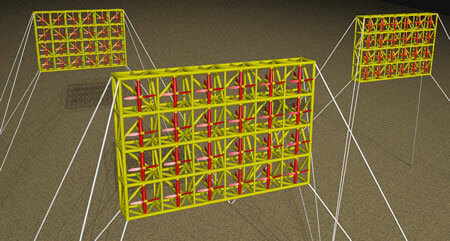 Open Ocean Current Catcher© Power Farms can take advantage of the strength of the community by connecting individual Open Ocean Current Catchers© together with a lateral mooring system, which makes it possible for "The Farm" to laterally support individual Current Catchers©. 100 year storm waves are rare and will probably only impose their peak load on one Current Catcher© at a time allowing the Current Catchers©, who are not receiving the 100 year storm crest load at the same time, to support the highly loaded current catcher. In some cases, it may be possible for power cables to be draped from Current Catcher© to Current Catcher© saving cable wear and costs. 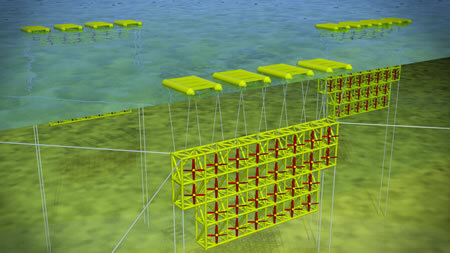 If the end user is an offshore platform, the switchgear and transformers could be located on the offshore platform. 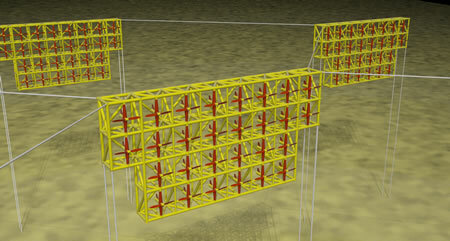 Current Catchers© can be positioned close together in most cases, especially in the case of unidirectional current flow, to allow power cable drape, but far enough apart to allow for maintenance / inspection vessel access, to allow for Current Catcher© offset and maximum dynamic movements and to allow for the possible future replacement of an entire Current Catcher©. Spacing between individual Current Catchers© will allow for the complete future replacement of individual Current Catchers©.